Home Tablets Lenovo TAB 2 A7-20 now available in the Philippines, priced at Php3,999! Lenovo TAB 2 A7-20 now available in the Philippines, priced at Php3,999! 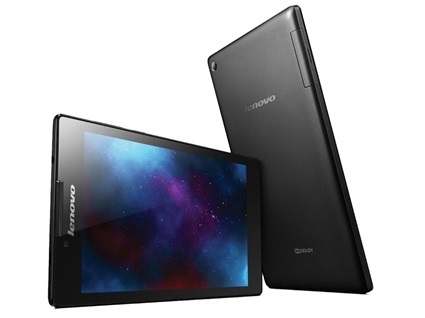 Lenovo TAB 2 A7-20: Designed for Portability! Weighing just 269g and at 9.3mm thin, the Lenovo TAB 2 A7-20 is designed for reading, listening to music, watching videos or surfing the web while on the go. The design allows it to fit in your hand comfortably. It is equipped with Dolby-enhanced audio that offers crisper audio for immersive entertainment experience. It can reach 8 hours of WiFi browsing on a single battery charge. Powered by a 1.3 GHz MediaTek quad-core processor, it brings reduced stutter, enables better multitasking and delivers a smoother Android experience. It also comes with a 7-inch IPS display with a resolution of up to 1024x600. The TAB 2 A7-20 delivers a vivid and colorful viewing experience both indoors and outdoors. Tab 2 A7-20 comes with Lenovo's new DOit series of apps so you can do more including sharing data with other Android devices without requiring a network, preventing viruses and malware, and backing up your contacts and SMS log. Its 16GB memory enables you to store all your important digital files without facing any space crunch. And when you need some additional space, you can use a microSD card and expand the memory of the tablet up to 32 GB. The TAB 2 A7-20 comes with an advanced 2 MP rear camera that is great for taking clear and bright pictures infused with superior clarity and picturesque details. The 0.3 MP front camera of the device can be used for capturing beautiful selfies. Lenovo Tab 2 A7-20 is exclusively distributed by MSI-ECS and is available thru its accredited retail partners for Php3,999 (SRP).